Those of you who’ve been reading Kitchen Jam since I launched it in August might have been wondering when the next recipes will be posted. Soon, gang – soon – and I promise you’re going to enjoy what I’ve got in mind for December! But this weekend instead of writing posts, I was building websites – one at patsteer.com that will be the new home of my survivorship blog Life Out Loud and my freelance writing projects; one for Kitchen Jam in development here; and one for Dog Trainer’s Log, evolving here. None of these sites is ready for prime time yet – although I’m aiming to launch all of them officially later this week. When all of the transitioning is complete, your links, bookmarks and RSS feeds to the WP.com sites will direct you automatically to their new domains. Until then, wish me luck as I work to make 30 years of writing and 10 years of tech training pay off. I’ll update this site with the final addresses. Meanwhile, feel free to drop by and check out the construction. Look for my special December blog-warming project at the new and improved Kitchen Jam: The 12 Jams of Christmas, featuring 12 new and easy jam recipes perfect for quick holiday gifts. I’ve also got special things planned after the New Year for both Dog Trainer’s Log and for the same old me (working under my real name now!) at Life Out Loud. Stay tuned! I didn’t find out about Under the High Chair’s Virtual Jam Swap in a straight-line kinda way. I was reading my latest Foodbuzz headlines, and saw a new post called Jam Swap from Coco Bean, a blog from the Montreal food improv team of Ian and Christie. Seems they’d discovered that canning – at first intimidating – could pay off just like a cookie exchange at their friend Aimee’s real-life Jam Swap. I followed their link to Aimee’s Under the High Chair blog (don’t you love the way links are the internet’s version of a bread crumb trail?) At UtHC, I discovered that in addition to her live jam swap, about which Ian had written, Aimee had just posted a round-up of her virtual (blogging) jam swap. Her post includes the links to the adventures (and misadventures) and 25 recipes from jammers who personify the improvisational approach to preserving flavor. UtHC’s jam swap also collected recipes for jams, butters, marmalades and spreads made with plums, rhubarb, apricots, peaches, blueberries, cherries, mint, peppers, berries and apples. I’ve got a lot of reading and recipe-sorting to do; I definitely need to put some of these recipes into my jam repertoire. Thanks, Aimee, for sending out the call for your Virtual Jam Swap, and then sharing all of the bounty with the world. What jams will you be making next – for holiday gifts, or when the fresh fruits in your area come back into season? Will you share your jam plans? This was not the post I intended for today. However, the picture of my poor 12-lb. turkey, left to roast in its 325 deg. F. oven for two hours too long was too priceless to ignore. I put my properly thawed turkey into its roaster, filled with sage and lemon halves. I woke to Alton Brown in my head, opining on The Next Iron Chef that “Good chefs sometimes have bad days in the kitchen.” Yep — and some days they have bad nights, too. I will at the very least be able to make some dog treats – Madison and Casey, true to their English cocker stomachs, love my homemade liver cookies. Maybe I can enrich them by substituting pulverized completely dried out roasted turkey for some of the flour. They have far less discriminating palates than my own. Do NOT put your turkey in the oven to roast after working a 12-hour day. You’ll need a crispity over-roasted turkey, or parts from one that has met this unfortunate fate. The bird should be seriously over-roasted, with all of the moisture (or most of it) roasted out – but it shouldn’t be charred; I have standards. 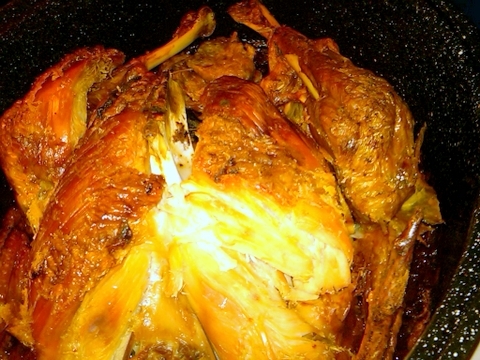 You will know that your turkey qualifies if you can remove the entire breastbone without disturbing any of what used to be meat, and if the parts that you would normally have sliced would dull a normal blade and will break off the carcass. The stuff that used to be meat should resemble the heavy bark on a well-smoked brisket. Break apart the sections which were over-roasted if they are too large to fit into your food processor. You think I’m kidding, don’t you? I’m not. I love my dogs, but I love my Cuisinart, too. If the sections you try to process are too large they will burn out the motor. I’m not gonna break my Cuisinart trying to salvage dog treats out of a badly roasted turkey. A Chinese meat cleaver may be helpful if the ‘bark’ (read: overdone parts) are really far gone. Pulse the sections briefly until they are either bite-size (no larger than 1/2 inch square) or pulverized if you intend to use the overdone bird as ‘flour’ to make dog cookies. Refrigerate the bite-size treats; use within two weeks. If using the pulverized bark in dog cookies, you can substitute the turkey ‘meal’ for flour 1:1 (dog cookies don’t need gluten to rise.) Dry the baked treats in the oven until they are crispity hard, and use within a month. You may want to keep treats made from a pulverized overdone bird under refrigeration – just in case. Happy poultry roasting adventures, everyone! My grandfather used to say tomatoes overproduce so that we could save some for February (by canning, of course!) As the produce aisles in the local stores fill up with fixin’s for Thanksgiving, I hear my grandfather’s voice. Only this time, we’re talking about the bushels of cranberries, and how beautiful a jar of cranberry jam looks on the Thanksgiving table. My sister likes jellied cranberry sauce out of the can; my mom loves her home-made chopped cranberry relish which, full of skins and fiber, is a little hard for me to digest these days. But I like the soft spread my grandfather used to make – cranberries simmered in orange juice and ginger with just enough brown sugar to be tart-sweet. Grandpa ran his cooked cranberries through a food mill after cooking to produce jam – a very different consistency than either conventional jellied cranberries or whole or chopped cranberry relishes. The taste is big and bright. No need for pectin – the cranberries bring enough pectin to the mix to produce jam. And the soft spread is much easier for me to digest. I found this recipe in an old cookbook, and the tastes are very similar to my grandpa’s recipe. It makes three cups, which is just about enough for a big family Thanksgiving – or enough to share if you’re feeding a smaller crowd. If you want to can the jam, fill clean hot four or eight oz. jam jars and leave 1/2 inch headspace. Add lids, and process in a boiling water bath for 10 minutes, according to the USDA directions for water-bath canning. Or you can fill containers suitable for freezing, seal and cool, and freeze. This jam will keep in the refrigerator for three to four weeks – or through the holidays, with plenty left to dress leftover turkey sandwiches or bake into jam filled holiday cookies. In a saucepan, mix together the orange juice, brown sugar and ginger. Heat the mixture, and when the sugar begins to dissolve, stir in the cranberries. Cook the cranberries until they pop open, stirring over medium heat to prevent scorching. Add more orange juice or water if the mixture thickens too quickly. Cook for 15-20 minutes on medium, or until the berries break down. 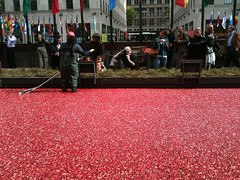 Put the berries through a food grinder or food mill to create a puree and separate out the cranberry skins. Once pureed, this makes about three cups of jam. Either process in a hot water bath according to USDA recommendations, freeze or keep in the refrigerator and use within 3-4 weeks. Here are the shout-outs to all of the canners, preservers and jam-makers who were recognized at this year’s Delaware State Fair during its July 23 – August 1, 2009. 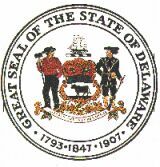 The .pdf of the official is at the Deleware State Fair site, and this link. Next year’s Delaware State Fair will be open from July 22 – July 31, 2010. Culinary-Sec. 1 – Jellies, Syrups, Etc. 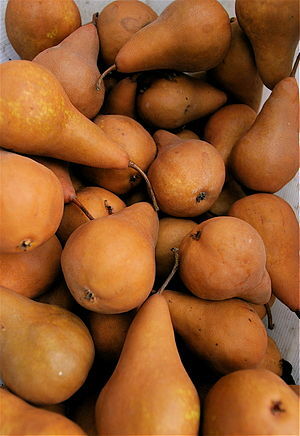 They are the last pears of the season – Boscs, juicy and sweet. Their perfume called to me from the far end of the farm stand. They were unblemised, slightly yielding to a gentle squeeze but not yet bruised, still firm enough to eat out-of-hand and not yet ready to be stewed into pear butter. Just perfect for these pears is the simplest of pear jams: pear honey, made with brown sugar and my current favorite jamming acidifier, white balsamic vinegar. It’s smooth, not-too-sweet, with a hint of the grated ginger. Unfortunately, my finished jam shots are a little too dark, but I’ll upload the color-corrected picture later today. Meanwhile, I’m enjoing this last taste of summer! Measure the fruit puree. Add the balsamic vinegar, and add water if needed so that the fruit puree measures 4 cups. When the boiling puree can’t be stirred down, reduce the heat to medium and maintain the steady boil, stirring constantly, until the mixture thickens and sheets from the spoon. Time will vary but this takes between 25-35 minutes. Remove from the heat, skim off any foam that rises, and ladle into hot jars you’ve prepared for water bath canning. Leave 1/2 inch headspace. Makes about 5 jars of pear honey. The North Carolina State Fair finishes its October 15-25 2009 run in Raleigh, North Carolina with the following jam-making and preserving results from the official state fair website. The fair features over 200 jam, preserves, marmalade, canning and junior competitor canning and preserving categories. Results appear here. I would love to include them all for a shout-out, but there are forty-four PAGES of results in mroe categories than I can count. To see the results in a spreadsheet, which is somewhat easier to download, download the results from the website. Congratulations to all who entered, and to those who came home with a placement or category winning ribbon. 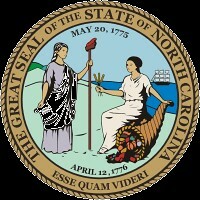 The 2010 North Carolina State Fair will be held in Raleigh form October 14 – 24, 2010. © Patricia A. Steer and Kitchen Jam, 2009. Unauthorized use and/or duplication of this material without written permission from the blog’s author and owner is strictly prohibited. Please feel free to excerpt and link, as long as you give full and clear credit to Patricia A. Steer and Kitchen Jam, with appropriate and specific direction to the original content. The photo on my title block is adapted from a photo of the Ball Jar Museum by Brandy Shaul, published on Flickr in April, 2006 under a CC license permitting adapted use with attribution.